An alternate method to associate Azure resources with Serverless360 is by registering a namespace using the connection string details. However, namespaces will support only the entities like messaging - queues & topics, event hubs and relays. For any other entities like Logic Apps & Functions, you will need Service Principals details. By default, Serverless360 will dynamically fetch the first available Shared Access Signature Authorization Key with Manage claims whenever necessary. Therefore it is necessary to have at least one SAS Key with Manage claims. Serverless360 does not store these connection strings in its data store. To associate a resource by namespace, you must first create a namespace in Azure and obtain the management credentials. In the left navigation pane of the portal, click 'New', then click 'Enterprise Integration', and then click 'Service Bus'. In the Create Namespace dialog, enter a namespace name. The system immediately checks to see if the name is available. 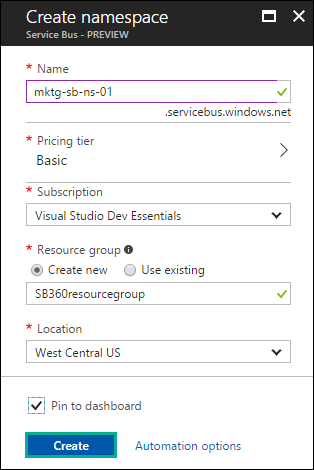 In the Subscription field, choose an Azure subscription in which the namespace has to be created. In the Resource group field, choose an existing resource group to which the namespace will belong to, or create a new one. In Location, choose the country or region in which your namespace should be hosted. In the Shared access policies blade, click 'RootManageSharedAccessKey'. We recommend you to create a new Shared Access Policy with the name - Serverless360. Enable all the three claims - Manage, Send & Listen. You can use this policy to associate the namespace with Serverless360. In the Policy: RootManageSharedAccessKey blade, click the Copy button next to Connection string–primary key, to copy the connection string to your clipboard for later use. Paste this value into Notepad or a clipboard to associate this connection string in Serverless360. Namespace can be associated in the Access Keys section under Settings in Serverless360 An illustration to help registering namespace in Serverless360 using the namespace connectionstring collected above.